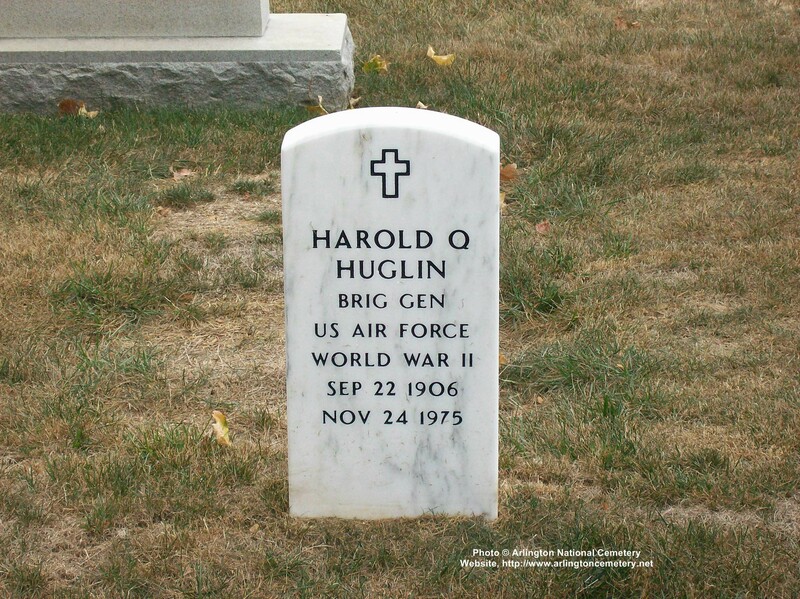 Harold Quiskey Huglin was born in Fairfield, Iowa, in 1906. He attended Parsons College there for a year, graduated from the U.S. Military Academy June 13, 1929, and was commissioned a Second Lieutenant of Field Artillery. Assigned with the 16th Field Artillery at Fort Bragg, North Carolina, in July 1930 General Huglin entered Primary Flying School at Brooks Field, Texas, and graduated from Advanced Flying School at Kelly Field, Texas, a year later. That December he was transferred to the Air Corps and assigned to the 49th Bomb Squadron at Langley Field, Virginia, later serving with the 16th Observation Squadron there. Going to Nichols Field in the Philippines in June 1935, in August 1937 he was assigned with the 32nd Bomb Squadron at March Field, California. Entering the Air Corps Tactical School at Maxwell Field, Alabama, in June 1939, General Huglin graduated three months later and assumed command of the Third Wing Bombardier School and the 90th Attack Squadron at Barksdale Field, Louisiana, becoming operations officer of the Third Bomb Group at Savannah Air Base, Georgia, in December 1940. The following August he was transferred to Bolling Field, Washington, D.C., as assistant operations officer of the Air Force Combat Command, becoming chief of the Training Division in the Office of the Directorate of Bombardment at Air Corps headquarters in March 1942. Going to England in February 1943, General Huglin was operations officer of the Third Bomb Wing, Eighth Air Force. He assumed command of the 100th Bomb Group the following June; the 13th Combat Wing in September 1943; 92nd Bomb Wing the following March; and resumed command of the 13th Combat Bomb Wing in November 1944. The following July he was appointed deputy commanding general of the Third Air Division. Moving to Wiesbaden, Germany, in November 1945, he was deputy chief of staff at Headquarters U.S. Air Forces in Europe, becoming operations officer there the following March. Joining the Air Transport Command in February 1947, General Huglin was deputy commanding general and chief of staff at ATC headquarters, Gravelly Point, Va., and that July he was relieved of his duties as chief of staff, continuing as deputy commanding general. Assuming command of the 530th Air Transport Wing, ATO, at Fairfield-Suisun Field, Calif., in June 1948 (redesignated the 1501st Air Transport Wing that September), when it was discontinued in June 1949 he became deputy commander of the Pacific Division of Military Air Transport Service at Hickam Air Force Base, Hawaii, assuming additional duty as commander of the U.S. Air Forces in the Pacific the following month. Transferred to Air Force headquarters, Washington, D.C., in July 1952, General Huglin was director of the Management Analysis Service in the Office of the Deputy Chief of Staff, comptroller. On Aug. 1, 1955, he was appointed director of the Planning Program Division, Plans and Readiness Area, Office of Defense Mobilization, Washington, D.C.
His decorations include the Silver Star, Legion of Merit, Distinguished Flying Cross, Bronze Star, Air Medal; French Legion of Honor and Croix de Guerre; Belgian Croix de Guerre, Czechslovakian War Cross; and order of the British Empire. He is rated a command pilot, technical observer and aircraft observer.